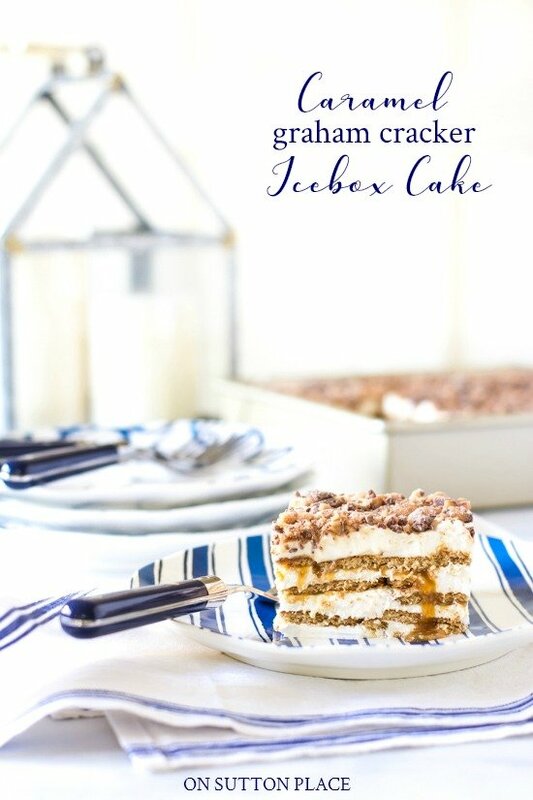 In this post: No-Bake Caramel Graham Cracker Icebox Cake recipe that can be made a day ahead. 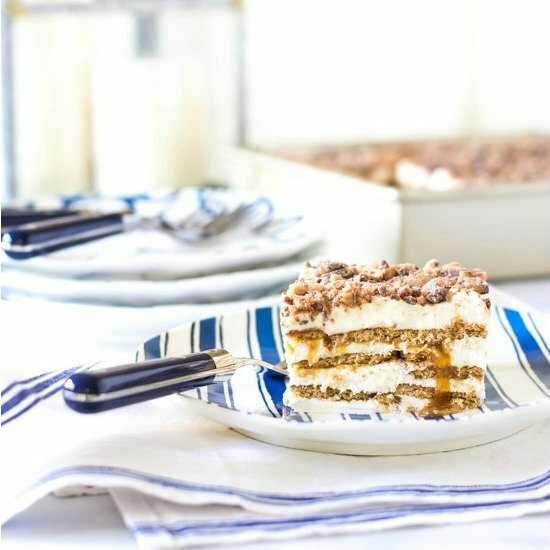 Perfect for holidays, this caramel icebox cake melts in your mouth! 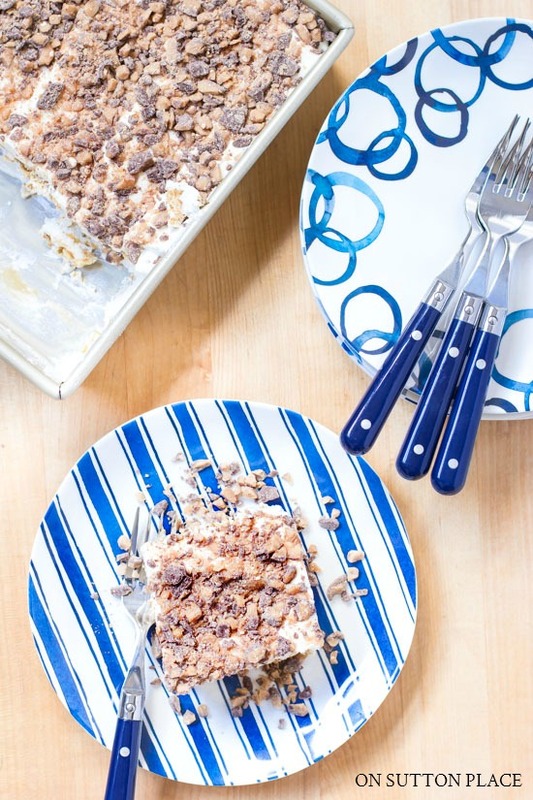 There are two things that icebox cakes usually have in common…graham crackers and Cool Whip. From there, the sky is pretty much the limit when it comes to combining textures and flavors. This caramel graham cracker icebox cake pairs gooey and sweet caramel sauce with crunchy Heath topping. Match made in heaven, right? Icebox cakes are easy, but there are so many other reasons to make them part of your dessert lineup. There is no baking. In my book, that’s one less step and a lot less time. They can, and should be, made a day ahead. Serving an icebox cake for a family gathering or party let’s you get it out of the way the day before the big event. All recipes can be adapted to serve just a few or a crowd. Icebox cakes last in the refrigerator for up to three days. In fact, the longer they sit, the better they get. The problem is that they don’t usually last that long! 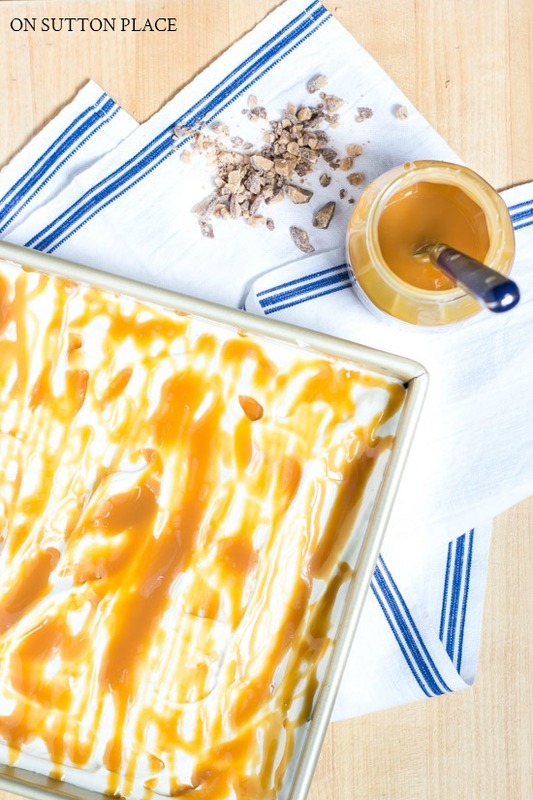 No-Bake Caramel Graham Cracker Icebox Cake recipe that can be made a day ahead. Perfect for holidays, this caramel icebox cake melts in your mouth! In the bowl of a standing mixer (or a mixing bowl with a hand mixer) beat cream cheese and sweetened condensed milk for 2 minutes. Gently fold in the entire container of Cool Whip. 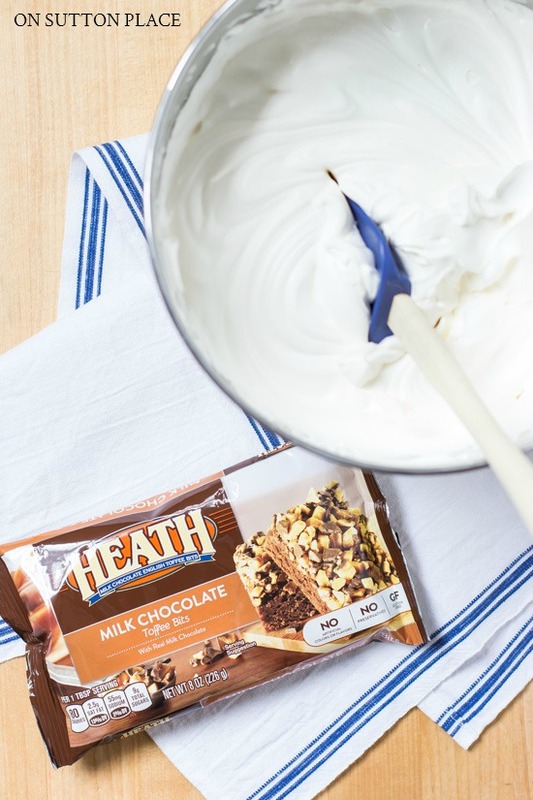 In an 8 x 8 or 9 x 9 inch pan, spread a layer of the Cool Whip mixture. Top it with a layer of graham crackers. Follow with another layer of the Cool Whip Mixture. Generously drizzle the caramel topping on the Cool Whip layer. Repeat with graham crackers, Cool Whip Mixture, drizzled caramel until you have reached the top of your pan. Make sure to end with the Cool Whip Mixture. Sprinkle Heath Milk Chocolate Bits on top of finished icebox cake. Refrigerate 6 hours. Overnight is best. For the topping, if you can’t find the Heath bits, crushed Heath candy bars would work too. Another idea is salted caramel chips…or combine salted caramel chips with chocolate chips. I used Smucker’s Simple Delight Salted Caramel Topping. The jar was 11.5 oz. and I used about half the jar. Any kind of caramel sauce will work. I was able to get three layers of graham crackers, using a 9 x 9 inch pan. Before slicing, run a very sharp knife under hot water. The heat makes the cut smoother and prettier. Any pan will work, but one with perfectly square corners works best. Here is my favorite 9 x 9 pan. I know we’re all busy and the next several weeks are going to be even busier. I just want to say thank you for spending part of your day with me. Time is so precious, and the fact that you spend some of your time here really is a blessing. I am very grateful for your friendships! More Christmas fun is coming tomorrow so if you don’t subscribe to OSP by email, click the button below to join us. That way you won’t miss a thing! This is just a quick note to say, “thank you.” Your decorating and home projects are spot on for me! They are simple, tasteful and charming. I’m indebted to you for introducing me to Waterlogue from which I have made some wonderful pictures! Today, however, you get top marks from me for your post about cleaning silver which I saved from a much earlier post. Cleaning the silver is always the kick-off to the holidays here and thanks to you, the job was finished on no time at all! Bless you! I really like your blog! This recipe sounds perfect for my coffee shop especially for my upcoming event month. I will make this. Thank you Ann for the lovely site! Ann, this recipe sounds so scrumptious! I am definitely going to make this over the holidays! Thanks, again, for all the wonderful posts you share with us! Have a great week! This recipe sounds perfect for the busy Thanksgiving season. Can’t wait to make it. Thank you Ann, I love your site!! First , I love this blog and have followed it for years. I’d like to cautiously comment on this recipe and similar ones appearing everywhere. What scares me is that the message is: this is easy. This tastes so good. My fear is that serving these types of processed sugars, loaded with of fats and additives, is going to come back to haunt Americans when they approach middle age. I recently attended my 50th high school reunion. Many of my classmates have developed heart problems, diabetes, obesity and a host of other health problems. Many were no longer “with us” or too sick to make the trip. In particular, one of our classmates who traveled a great distance to be with us, was sadly obese. Fast forward two months and we hear our friend died suddenly. I recall when I was a young mom I too served my family these creamy, gooey, easy to make recipes, especially around the holidays. I felt like I was a good mom at the time but now, seeing the effects of a lifetime of poor eating, I’m feeling like maybe yummy and easy desserts were a part of the problem. We all know about healthy alternatives. Many of us exercise more and take vitamins and supplements . Sadly we continue to eat and feed this junk to our grandchildren. holiday and a Healthy New Year. Moderation. I basically think you are right. We do not eat these all the time. On special occasions. If one consume these all the time then it could be harmful. Everything should be in moderation. Hi Nancy…first of all, thank you for your comment. If you have followed my blog for years, then you know I’m a simple cook, who likes easy and quick recipes. My goal was simply to offer a new idea for a dessert when you are hosting a family gathering or dinner with friends. I’m certainly not an expert, but I believe that if we’re in good health to begin with, we can enjoy a sweet treat every now and then without causing harm to our health. Moderation is the key. Thank you again and happy holidays! Yummy, Scrumptous, Gooey Desserts are just that ! A piece of DESSERT, NOT a entire meal. My Grandparents all lived a long life and always ended their meal with some type of dessert. They had their own eggs, milk, and heavy real cream which were included in their sweets. So I agree, (all in MODERATION) and we can be Happy & Healthy.